I still remember those days when the more practical means of travel to and from Bohol is by boat. Plane fares then were way above the normal Boholano's budget. We learned to accept and enjoy the many hours of travel time on those MV whatever. Then the MVs became Super something. Until someone thought "it is time every Juan flies". Now, with the leading airlines all dropping their prices, plane fares seem to be almost as cheap as boat fares, maybe even cheaper. All of sudden, going home is no longer a yearly thing for us. All of a sudden, Bohol is no longer that far. 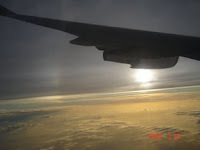 Here is a lovely sunset photo on board one of those planes.